The Root Rake is ideal for fast clean-ups, vegetation management, sifting soil/rocks and removing unwanted shrubbery and overgrowth. Material can be sifted and sorted to clear out unwanted debris and leave good soil or material behind. Both in reverse and forward direction. Available for 3-10T excavators. Made to last, the Root Rake is manufactured from top grade 5/8" thick steel. Coupled with quality workmanship to give you peace of mind. The ingenious tyne design allows the rake to be used in both a pulling and pushing motion. 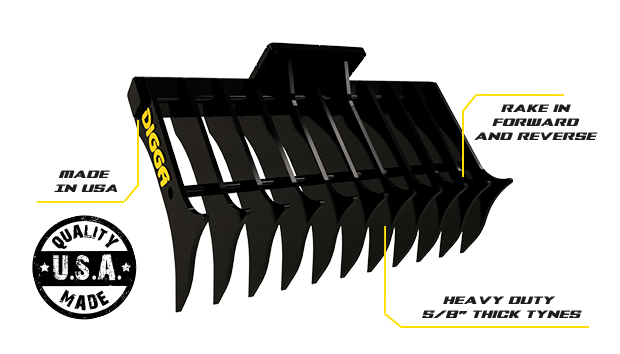 Quality products are manufactured in-house by Digga in America. We use only the highest grade materials and strictest quality control.